Sincere thanks to the following local businesses for sponsoring the 2018-2019 Yearbook. Thanks to their generosity, the price of the yearbook will remain at $15.00. Nash Steamer Vac Services Ltd. Pipe Quest & Gummows Construction Ltd. The Swan Hills School Yearbook bursts with photos, student portraits, activities, highlights, and, of course, space for special autographs. 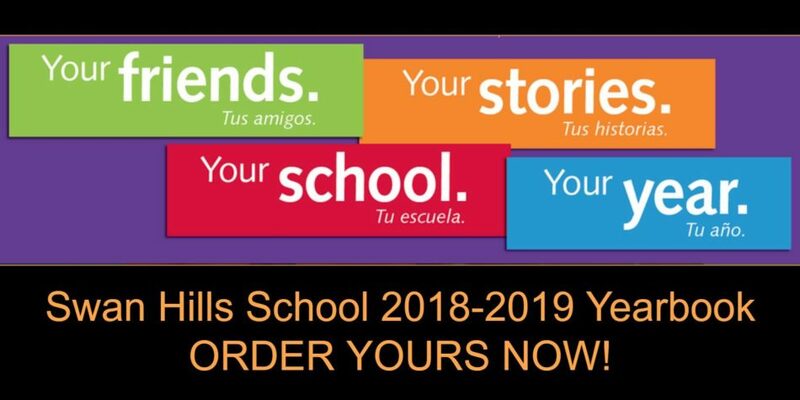 The smiles and memories of your year at Swan Hills School will be remembered forever in the full colour 2018-2019 yearbook, which you will receive before school gets out in June and will treasure for a lifetime! You can order your yearbook online at YBPay.lifetouch.ca (use school account #10573319) or download our order form to pay by cash or cheque. We need to know how many before we place our order, so, to ensure June delivery, we have set an April 26 deadline for ordering. Get yours in now!